Thousands of leftists, Arabs, protest in Tel Aviv, many waving PLO flags. 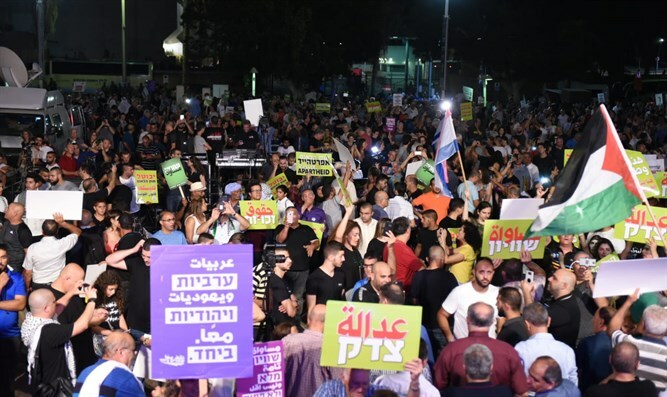 Thousands of leftists and Arabs arrived on Saturday evening at Tel Aviv's Rabin Square to protest Israel's Nationality Law. The protest was organized by the High Follow-Up Committee for Arab Citizens of Israel, and supported by leftist organizations. Protesters walked from the Rabin Square to the Tel Aviv Museum, with many of them waving Palestine Liberation Organization (PLO) flags. Shouts of "With blood and fire, we will redeem Falestine" (Falestine is the Arab pronunciation of "Palestine" - ed.) could be heard as well. The US designated the PLO as designated a terror organization in 1987. In 1993, the organization claimed to renounce all connection to terrorism and violence. However, it has continued involvement in violence. The PLO is headed by Palestinian Authority Chairman Mahmoud Abbas. Joint Arab List Chairman MK Ayman Odeh said, "Today we want to send a clear message: A democratic country must include all its citizens. There is no more moral statement than to say that the Nationality Law is apartheid, and there is no better response to the inciting government than tens of thousands of protesters in the streets." Science, Technology, and Space Minister Ofir Akunis (Likud) pointed out, "If anyone had any doubt of why the Nationality Law is crucial, the pictures from Tel Aviv this evening are clear and unambiguous proof that Israel needs the Nationality Law." "Opposing those who undermine the fact that Israel is the Jewish People's nation state are the blue and white flag, and the national anthem of 'Hatikva', Basic Law: The Nationality Law is one of the most important laws legislated in Israel during the past few years." The Nationality Law states that Israel is the Jewish People's nation state and establishes as law Israel's flag, symbols, the Hebrew language, and various other items mentioned in the Declaration of Independence. The law does not affect the rights of minority citizens in Israel.